A total of eight military shooting ranges were used for this study. Soil samples were collected at each of the eight shooting ranges at the berm, target line, 50 and 100 m from berm. 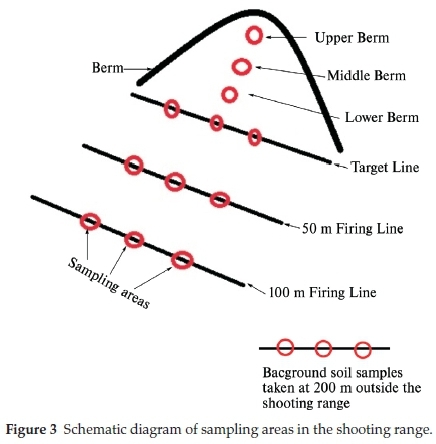 In all of the shooting ranges investigated the highest total lead (Pb) concentrations were found in the berm soils. Elevated Pb concentrations of 38 406.87 mg kg-1 were found in the berm soils of TAB shooting range. Most of the shooting range soils contained high levels of Pb in the range above 2000 mg kg-1 far exceeding the United States Environmental Protection Agency (USEPA) critical value of 400 mg kg-1. The predominant weathering products in these shooting ranges were cerussite (PbCO3) and hydrocerussite (Pb3(CO3)2(OH)2). The Synthetic Precipitation Leaching Procedure (SPLP) Pb concentrations exceeded the USEPA 0.015 mg kg-1 critical level of hazardous waste indicating possible contamination of surface and groundwater. Keywords: Soil pollution, Pb, berm, ammunition, shooting range. Pb contamination has not only been restricted to shooting range soils but pollution in water has also been detected in surface water samples at places close to shooting ranges.17,18 The study by Stansley and co-investigators indicated elevated levels of Pb of 1270 L-1 in surface water within the shot fall zone of the impact berm compared to nearby control areas of less than 1μg L-1 of total Pb within short distance from the shooting range.18 In 1988, VanBon recorded Pb concentrations of 1300 μg L-1 in surface water on a clay shooting range.5 Increased levels of Pb were also recorded in Florida's firing range at a concentration of 289 μg L-19 near the firing line while quantities of 473μg L-1 have been reported by Craig and co-workers17. Botswana should not be an exception to Pb pollution in shooting ranges since it uses ammunition regularly for training at shooting ranges by the Botswana Defence Force (BDF), Botswana Police Service (BPS), Botswana Prisons Service (BPS) and the Department of Wildlife and National Parks. However, since their inception there has not been a single research study on the environmental impact of Pb at the shooting ranges used by these government bodies. The only research on pollution from Pb that has been done focused on vehicular emissions.22,23 Kgosiesele and colleagues have reported an annual Pb from battery waste of 46 000 tones and this could also be contributing to the amount of soil contamination from Pb.24 The objectives of this study are 1) quantification and evaluation of the prevalence of Pb pollutant from ammunitions in the soils from shooting ranges in Botswana, 2) carry out Synthetic Precipitation Leaching Procedure (SPLP) to simulate acid rain to ascertain for the mobility and possible contamination of both surface and groundwater, and 3) providing feedback to stakeholders, in particular the government of the Republic of Botswana, to assist on policy formulation. Based on the extent of soil contamination, best range management practices will be recommended to the range users and stakeholders such as soil clean-ups and Pb immobilization to minimize mobility of this toxic metal to water sources and nearby agricultural soils. A total of eight shooting ranges were selected in southern and central Botswana. The eight sampling sites were located in or near the villages of Mogoditshane (MOG, GPS coordinates: -24°37'36.98' South, 25°51'56.02' East), Mochudi (TSH, GPS coordinates: -24°24'59.99' South 26°08'60.00' East), Makanke (MAK, GPS coordinates: 24°33'11.00' South 25°48'14.00' East), and Thebephatshwa (TAB, GPS coordinates: 24°13'18.40' South 25°20'53.80' East) in southern Botswana and other shooting ranges such as Shoshong (SHO R1 and SHO R2, GPS coordinates: -23°01'60.00' South 26°30'59.99' East) and Paje (PAJ R1 and PAJ R2, GPS coordinates: -22°16'12.00' South 26°47'14.39' East) in the central Botswana as shown in the map below (Fig. 1a). For each shooting range, a background soil sample was collected 200 m outside the shooting range. The shooting activities taking place at these sites involve use of small arms assault rifles mainly of the 0.50', 5.56 mm and 7.62 mm calibres. The rainfall patterns indicate that most of the shooting ranges receive more rainfall during the months of October to March as shown in Fig. 2 below. These sites experience high amounts of rainfall in the summer and little to no rain during the winter season. The summer season covers the months of September to April with only four months of winter, May to August. The summer seasons can record high amounts of rainfall, as much as over 300 mm, as experienced by SHO shootingranges duringthe month of December. A total of 48 soil samples were collected from each shooting range to a depth of 20 cm from the earth surface using a soil recovery probe. The soil samples were collected in quadruplicates at three sampling areas on the berm, target line, 50 and 100 m from the target line along a central transect (Fig. 3). Each sampling area was circular with a radius of 150 cm. Background soils were collected from the areas that were not impacted by lead bullets outside the shooting range at a distance of 200 m from the shooting range. Butyrated zip-lock plastic bags were used to store the soil samples. The field soil samples were then transported to the laboratory to start the sequence of analyses. The quadruplicate soil samples collected from the three sampling areas at the berm (bottom, middle and upper), target line, 50 and 100 m position line were mixed together to make three composite soil samples representative of each position line. The soil samples were air dried and passed through a 2 mm stainless steel sieve to remove large particles such as rock pebbles, spent lead bullets and tree matter. A portion of the soil samples was pulverized using a manually operated Retsch RS 200 Vibratory Disk Mill at 700 rpm for 3 min and then stored for X-Ray Diffraction (XRD) analysis. A series of 0.100 g of soil samples were digested in 25 mL of 10 % HNO3 for 16 h using the dry heating-block digestion procedure (USEPA Method 3050). The physical and chemical properties of the shooting range soils such as pH, organic matter (OM), cation exchange capacity (CEC) and metal content were all determined using standard methods. The pH measurements were carried out by adding to 20 g of the homogenized soil sample 40 mL of deionized water and 0.01 M CaCl2 solution. The solutions were stirred vigorously. The slurry was allowed to settle for 30 min. A calibrated crimson basic 20 pH meter was used for pH measurements at 25 °C. The Walkley-Black procedure was used to measure the organic matter (OM) content of the soil samples.26 Cation exchange capacity (CEC) of the soils was determined using method 9081. A sequential extraction process adapted from Tessier et al. (1979) was used to separate the berm soil Pb into different fractions so as to determine the mobility and availability of Pb.30 The fractions of the soil are in the forms: water-soluble and exchangeable (WE); carbonate bound (CB); Fe-Mn oxides (FM); organic matter bound (OM) and the residual (RS) fractions. To better understand the potential health hazards from contamination with Pb, the different chemical species in which Pb exist in the shooting range soils (free metal, metal-organic complexes and salts) were determined. The different Pb species and their reactivity with the specific target constituents of the soils help ascertain their mobility and bioavailability in the environment. Samples were digested using USEPA Method 3050 and analysed for total Pb concentrations using inductively coupled plasma optical emission spectrometry (ICP-OES; Perkin Elmer, Optima-7300DV). Quality control samples included certified reference material (CRM) of soil, NCS DC 73320, obtained from the Botswana Geoscience Institute (Chemistry Lab). All the shooting ranges studied were contaminated with Pb (Fig. 4a-d). The highest total Pb concentrations were found in the berm soils. It is worth noting that the soils analysed for total Pb concentration are the soil particles of less than 2 mm in diameter obtained by sieving the soil samples through the 2 mm stainless steel sieve. TAB shootingrange berm soils accumulated the highest total Pb concentration of 38 386 ± 10 197 mg kg-1 followed by MAK at 25 193 ± 3338 mg kg-1 (Fig. 4a). 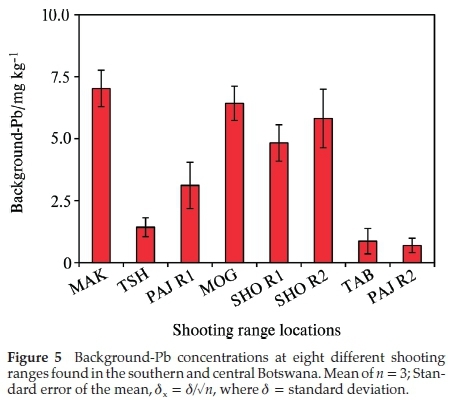 The highest total Pb concentration experienced by TAB (established in 1995) shooting range can be attributed more to the frequency of use of the shooting range. The TAB shooting range belongs to the special force unit (Commando unit) of the Botswana Defence Force. The special force unit carries out intensive shooting practices to sharpen their marksmanship skills. These shooting practices can occur as often as once a week to more than once a week. The MAK shooting range, even though older than the TAB range (established in 1983), has accumulated less concentration of Pb on its berm soils. This does show that the overall concentrations of Pb are more closely related to the frequency of shooting at each shooting range. These findings are consistent with the results obtained by Rooney and McLaren (2000)31. The lowest total Pb concentrations were measured at the berm soil of PAJ R2 shootingrange(85 ± 42mgkg-1)andSHOR2(728 ± 527mgkg-1) as displayed in Fig. 4a. The PAJ R2 is a pistol range while the SHO R2 is an obsolete rifle range that has not been used for many years. According to military personnel, pistol firing is only restricted to use by military officers who are normally few in number, this may be a contributing factor to the small concentration of total Pb at the PAJ R2 shooting range. Pistol ammunition contains less amount of Pb slug of about 52 % as compared to assault rifles with over 80 % Pb slug content. The less Pb content in pistol projectiles could be a contributing factor to the low pollution in pistol shootingrange soils. The SHO R2 has not been in use for some few years. There is a high possibility that the weathered Pb has leached further underground with some of the Pb having been washed off the surface of the ground by runoff water from rain. 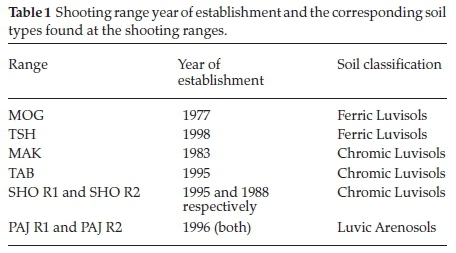 In all eight shooting ranges studied, the highest total Pb accumulation occurred in the berm soils (Fig. 4). The highest total Pb concentration in the berm soils can be attributed to accumulation of lead bullets, projectiles and shots into the berm. Cao et al. (2003)9 found that the total Pb concentration in the berm soils was directly related to the build-up of bullets, shots and projectiles in the berm corroborating our results. The total Pb concentrations decreased as one moved away from berm to the target line, 50 and 100 m shooting lines. The target line soils total Pb concentrations are second highest to the berm soils total Pb concentrations (Fig. 4b). Target line total Pb concen-trationsweremeasuredat1200 ± 320,149 ± 17,45 ± 3,1554 ± 35, 13204 ± 2408 and 13±6mgkg-1 for MAK, PAJ R1, MOG, SHO R1, SHO R2, TAB and PAJ R2, respectively. The target line is closest to the berm, there is high possibility that some of the weathered Pb might have mobilised and migrated down the berm slope contributing to the high concentration of total Pb at the target line. Another contributing factor to the high concentrations of total Pb in the target line soils could be the Pb powder emitted due to the friction between the bullet and the target as the bullet pierced through the target. It is important to note that the total Pb concentrations at the 100 m shooting line were higher compared to the 50 m shooting line for most of the shooting ranges such as the TSH (2681 mg kg-1), TAB (896 mg kg-1), MAK (647 mg kg-1) and SHO R1 (442 mg kg-1) at the 100 m shooting line compared to TSH (105 mg kg-1), TAB (71 mg kg-1), MAK (605 mg kg-1) and SHO R1 (19 mg kg-1) at the 50 m shooting line. According to military personnel, most of the shooting practice takes place at the 100 m shooting line implying that as bullets, shots and projectiles move through the barrel of the rifle there is friction created between the bullets and the barrel riffling's leading to the discharge of Pb powder into the 100 m shooting line soils leading to higher concentrations of total Pb at 100 m than at 50 m shooting lines. The background total Pb concentrations were less than 10 mgkg-1 in all the shooting ranges studied (Fig. 5). This implies that Pb mobility maybe restricted within the shooting ranges and their immediate surroundings. Quality assurance was carried out through analysis of certified reference material, NCS DC73320 of known concentration of 20 ppm (20 mg kg-1). The CRM was subjected to the same experimental condition as the soil samples with average measurement of 17.3 ± 0.6 mg kg-1 (mean ± standard error of the mean). The accuracy of measurements was <3 % RSD, an indication of accuracy of the analytical methodology. 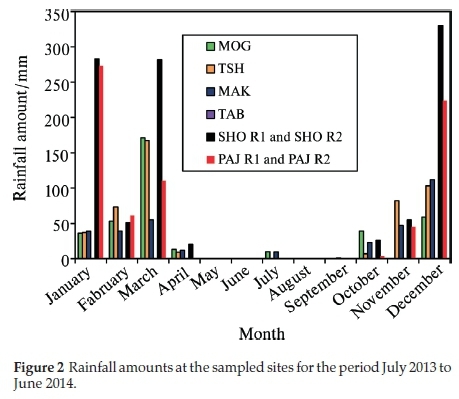 The mobility of Pb in the soil due to acid rain was simulated using the SPLP procedure.27 The SPLP Pb concentration was highest in the berm soils of TSH range at 787±8mgkg-1 followed by PAJ R2 and TAB ranges at 448 ± 4 and 398 mg kg-1, respectively (Fig. 6). The lowest SPLP Pb concentration was recorded in the PAJ R2 soils with a concentration of 0.1 ± 0.08 mg kg-1. In all of the eight shooting ranges studied the SPLP Pb concentrations exceeded the USEPA 0.015 mg kg-1 critical level of hazardous waste.29 This indicates that some of the Pb may have leached out from the shooting range soils giving rise to possibility of surface and groundwater contamination. Sequential extraction procedure is commonly used to ascertain the chemical mobility, availability, leaching and distribution of metals in the soil.32 The partitioning of Pb in the different soil fractions is largely dependent on the chemistry and geochemistry of the soil such as its pH, cation exchange capacity, organic matter content and presence of other chemicals in the soil. The sequential extraction method takes place with the assumption that the partitioning of the metal within each fraction is lowered with each successive extraction step.30 All the Pb in the shooting range berm soils were found to be linked to the carbonate fraction (CB), 46-68 % (Fig. 7). The berm soil Pb associated with the organic matter (OB) was also found to be in substantial amounts of 2-47 % followed by the Fe-Mn oxides (FM) bound Pb (1-37 %), water-soluble and exchangeable (WE) (0-19 %) and lastly the residual Pb (0-5 %). 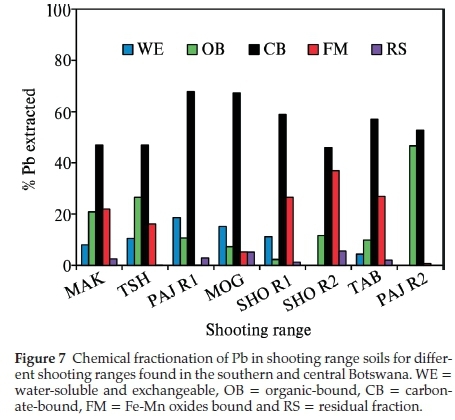 The existence of Pb in the berm soils bound mainly to the carbonate fraction (CB) can be attributed to the weathering processes of Pb bullets and shots such as oxidation of metallic Pb and carbonation of the oxidised Pb (PbO).9 There was a correlation between the soil pH and the total Pb concentrations found in the shooting range soils studied. As shown in Table 2 below, TAB shooting range with the alkaline pH of 8.25 experienced the highest accumulation of total Pb in its soil. The alkaline pH is regarded as a favourable condition for the stability of Pb oxides and carbonates. This corroborates the fractionation results (Fig. 7) where considerable amounts of Pb were associated with the carbonate fraction. Soil moisture has been reported to play a crucial role in the weathering of Pb bullets and shots. The soil moisture helps in the erosion and corrosion of Pb bullets and shots through the formation of a water layer on the Pb bullets and shots surfaces making it easy for the diffusion of atmospheric gases to reach and attack the metal surfaces leading to the formation of Pb weathering products such as Pb oxides, sulphates and carbonates and subsequent dissolution of these Pb compounds into the shooting range soils.33 The areas studied have a good annual rainfall supply as shown in Fig. 2. Rainfall amounts have been recorded to as high as 103 mm (December 2013) for TAB (with total Pb concentration of 38386 ± 10197 mg kg-1) shooting range for the year June 2013 to July 2014. Other months in the same year for TAB shooting range have recorded rainfall amounts of as high as 50 mm (November 2013 and March 2014). Other shootingranges such as SHO R1, SHO R2, PAJ R1 and PAJ R2 have experienced rains as high as 230-320 mm (Fig. 2). Even though the frequency of shooting in these ranges was not high, significant amounts of total Pb concentrations were found at SHO R1 and PAJ R1 measured at 3075 ± 611 and 4608 ± 748 mg kg-1, respectively (Fig. 4). Organic matter has been found to be an important factor in the weathering of Pb bullets and shots. The presence of organic matter in the soil accelerates the transformation of metallic Pb into its Pb oxides and carbonates. 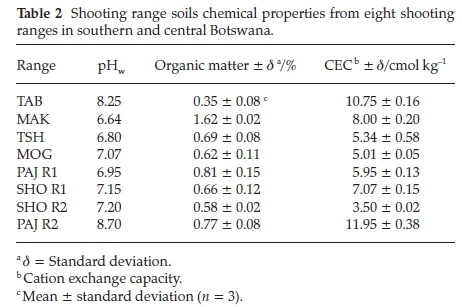 This takes place through the production of CO2 by microbial organisms in the soil rich in organic matter making the CO2 available for the weathering of lead bullets and shots into Pb oxides and carbon-ates.34 Organic matter was high in all of the shooting ranges studied, 0.35-1.62 % (Table 2), a favourable condition to the weathering of Pb in soil leading to increased mobility and availability of Pb in the shooting range soils. The soil cation exchange capacity (CEC) plays a crucial role in the mobility and bioavail-ability of Pb. The higher the CEC of the soil the higher the binding capacity of Pb leading to significant reduction in Pb mobility and bioavailability and vice versa.9TAB and PAJ R2 experienced the highest CEC values of 10.75 and 11.95 cmol kg-1, respectively and SHO R2 recorded the least CEC of 3.50 cmol kg-1. 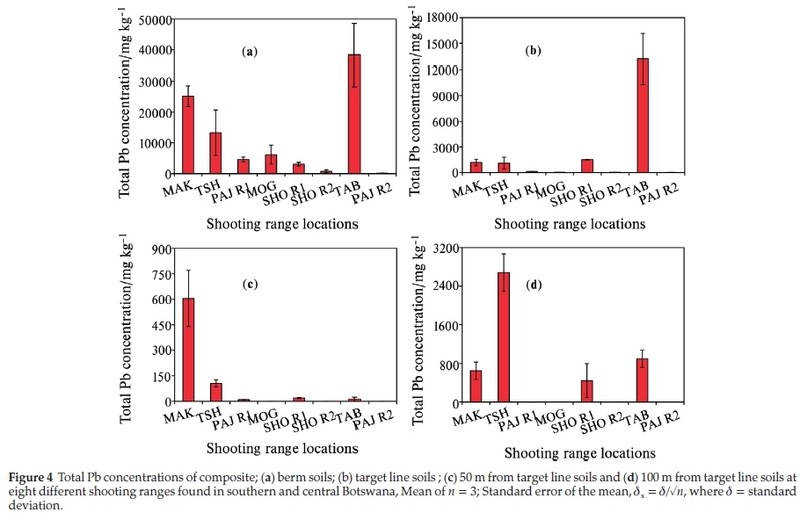 Coupled with other factors such as higher pH of 8.25 and frequency of use, the highest total Pb concentrations in berm soils were recorded in TAB shooting range (Fig. 4). Total Pb concentrations of PAJ R2 were the lowest even though this range has high soil CEC and high soil pH. The main reason for this lower Pb concentration is that, PAJ R2 is a pistol range used to fire 5.56 mm ammunition that contains the least amount of Pb, about 56 % compared to other ranges whereby all bullets of 7.62 mm, 5.56 mm and 0.50 mm with Pb content of 77 %, 56 % and 1 % are shot into the berm soils.35 In addition this range is situated in a military training camp and it is used less frequently for training military officers in shooting pistol firearms, about four to seven times in a month for six months in a year. SHO R2 soils have the lowest CEC with pH values in the neutral region (7.15). This range is obsolete and the low soil CEC may have provided a favourable condition for the solubility and mobility of Pb. The total Pb concentrations in the berm soils in the seven of the eight shootingranges studied exceeded the USEPA critical value of 400 mg kg-1. The PAJ R2 shooting range showed total Pb concentration of less than 400 mg kg-1 due to the fact that it is a pistol shooting range. Pistol ammunition contains less amount of Pb slug of about 52 % as compared assault rifles with over 80 % Pb slug content. 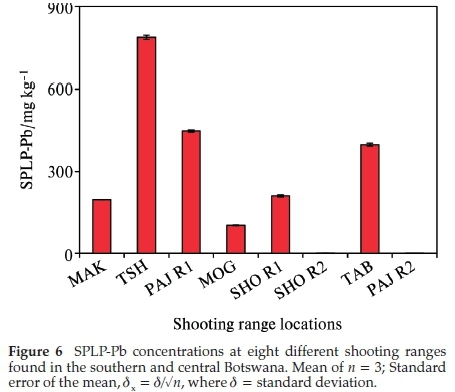 The SPLP Pb concentrations in all of the eight shooting ranges studied exceeded the USEPA 0.015 mg kg-1 critical level. This implies that there is potential for the polluted soils to contaminate both surface and groundwater. Soil physical and chemical properties have strong impact on the weathering of Pb shots and bullets. The high pH and organic matter experienced by the soils in the shooting ranges investigated may have contributed significantly to the transformation of Pb in to the different weathering products. 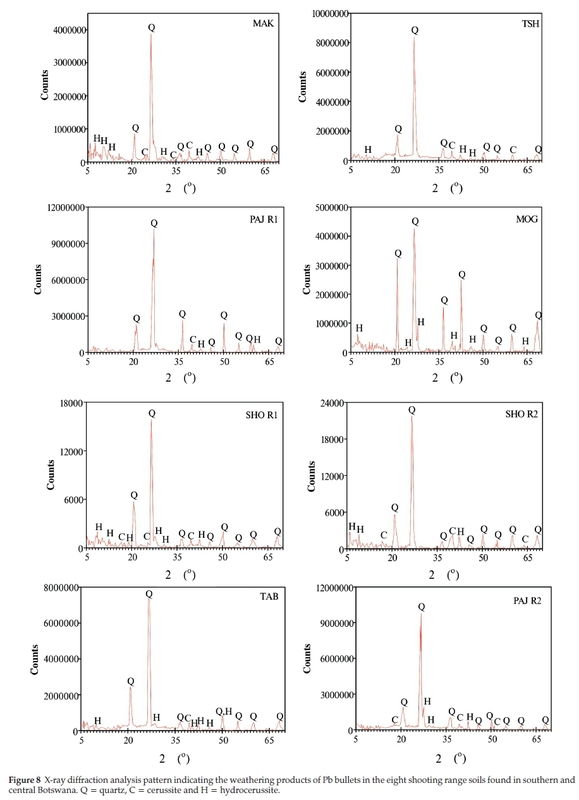 The XRD patterns show that cerussite and hydrocerussite were the predominant weathering products in all of the eight shooting ranges in this study. Our findings suggest that best shooting range management practices are required as a matter of urgency to arrest this pollution problem before it spirals out of control. The application of phosphate rock has been found to significantly immobilize Pb and reduce its solubility in the soil. This research is sponsored wholly by the Botswana International University of Science and Technology (BIUST). The authors would like to thank Botswana Defence Force (BDF) for availing their shooting ranges to be used in this study. An appreciation is also extended to the Botswana Geoscience Institute (BGI) for their assistance with their ICP-OES and XRD instruments for the chemical analysis.